Description: Plumbago is a low-growing groundcover with shiny green foliage coming up late in the spring and blooming late in the summer with blue star-shaped flowers. In the fall the foliage turns dark red.Attracts butterflies. Deer resistant. Good for erosion control. The plant blooms through and beyond light frosts. Frosts only add to its interest in the garden by inducing a rich red fall leaf color. Care: Heat and drought tolerant but can take moist soil conditions also. Doesn't need much care. Easy to grow, very hardy. 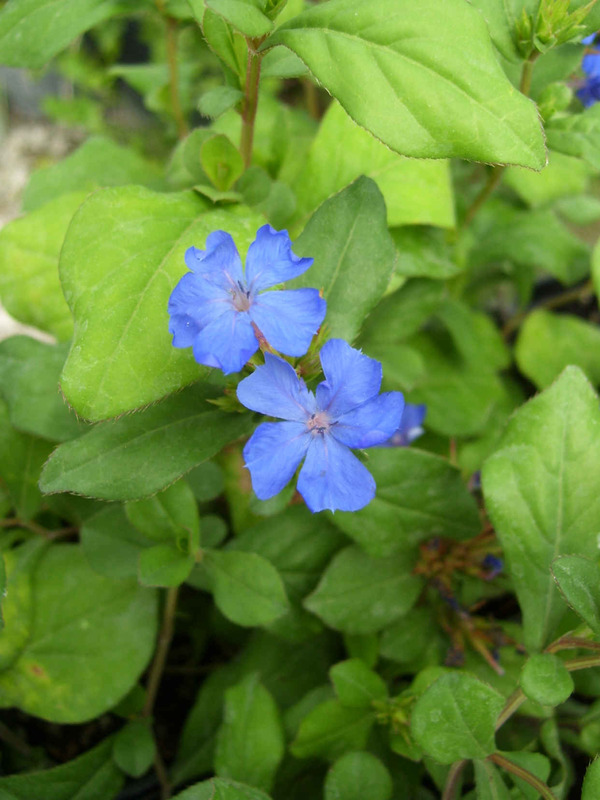 Plumbago is very shade tolerant, blooming in spots that receive only a couple hours of sunlight daily. It also thrives in full sun. Plants prosper in average soils and require only occasional watering once established.